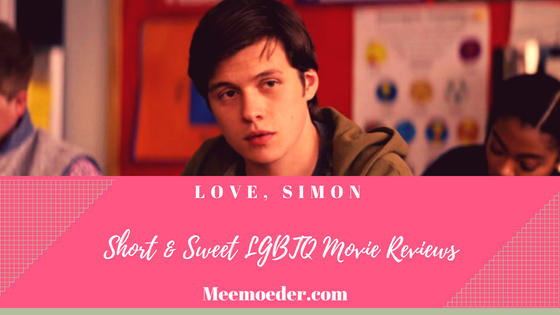 This week in Short & Sweet LGBTQ Movie Reviews, you will find the 3 things that I like about Love, Simon and the perfect mood for watching it. Being in my thirties, I am probably not the target audience for this movie. Still, l enjoyed watching it because I feel this coming-out story goes further than other coming-out stories and it had some good jokes. You can find Love, Simon on Amazon and iTunes. Yes, there are a lot of coming-out stories. Yes, our community needs more storylines than just people coming out or falling in love. I agree. However, I also believe that in this day and age, with increasingly more hate crimes, fear, and intolerance, the teenagers of our community still need new coming-out stories, especially men. Consequently, I welcome Love, Simon with open arms, even though the protagonist is a white, cis-gender kid from American suburbs. We definitely need more diversity within the coming-out genre but Love, Simon is very much needed as well. If Love, Simon only had a coming-out story, the audience would no longer have been engaged and moved. Coming-out stories need more material to do that. Instead of a whodunnit, Love, Simon turns into a whowasit. The twist to this story is that you know whodunnit when Simon’s emails were made public but you do not know whowasit when Blue signed his emails. The quest for Blue makes it interesting. At times, if you recognize the same disappointments from your younger years, the quest also makes this movie slightly painful to watch. Another thing that I liked about Love, Simon was that Simon was not perfect. You were not feeling sorry for him the entire time simply because he had a hard time coming to terms with his sexual orientation. I do not want to give away any spoilers but trying to hide the fact that he is gay, he did mean things to his friends behind their backs, putting his interests before those of his friends. So, Simon had to learn a few things about tolerance and empathy himself, which made this coming-out story enjoyable for me to watch. If you are not in your teenage years anymore, you might be somewhat apprehensive about watching this movie. Will you be able to relate and enjoy yourself? From experience, I can tell you that you can. My wife and I both laughed quite a few times as there were some really nice jokes. Also, certain situations were so awkward that we could not help but laugh. Fun fact: One of my contact lenses fell out right before the movie started. So, I had to watch it like that. Even under these circumstances, I completely enjoyed myself! Want to watch or read the story? As I said, you can watch Love, Simon on Amazon and iTunes. The movie is based on the book Simon vs. the Homo Sapiens Agenda, which you can find on Amazon, Barnes & Noble, Waterstones, Rakuten Kobo, Book Depository, Audible, and Bol.com. You might also enjoy my other two episodes of the Short & Sweet LGBTQ Movie Reviews: Becks and Nobody Famous. Don’t forget to subscribe to my mailing list!